Yeah, yeah, yeah: There’s a new iPad coming out. But you know what makes the iPad exciting and useful? Apps. And we’re here to tell you about the best. Already this week, Macworld brought you news of the launch of Square Register, an app that turns your iPad into a cash register, as well as Electronic Arts’s move to pull The Simpsons: Tapped Out from the App Store. And with the upcoming launch of the Retina-enhanced “new” iPad, editor Philip Michaels brought us news that Apple is upgrading some of its own apps—including Find My Friends, iTunes U, Remote, and more—for compatibility with the new high-resolution display. We also offered a more complete list of Retina-display-ready apps. One other thing to note: The ever popular Flipboard app saw an update this week that brings its new iPhone “Cover Stories” feature to the iPad, as well as some shifts in typography and picture display. AP Mobile: The Associated Press was one of the first new organizations to create its own app after the iPhone launched a few years ago. Back then, AP Mobile was a fairly staid app that mostly just contained a list of the service’s stories. The latest version, launched this week, shows the venerable agency working to keep up with the times. The app is now universal, optimized for both phone and tablet, and features a more photo-driven display of stories. More notable is the new My AP feature, which lets users customize the app’s content by selecting or de-selecting categories of news. The app also includes more social media offerings, letting users share stories to Facebook and Twitter. AP Mobile is free. Frames: If you’ve ever wanted to make your own Wallace & Gromit-style adventure, here’s your chance. Studio Neat’s $3 Frames gives users of recent iPhone (the iPhone 4 and 4S) the ability to make their own stop-motion movies. The app can capture and export movies in 720p high-definition quality; you can also adjust the frames-per-second of a video shot, or add frames to an existing project. You might want to do a little comparison-shopping before you buy, however: Frames offers many of the same features as the cheaper Timelapse Pro app that’s been around for awhile. 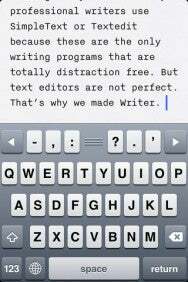 iA Writer: We at Macworld have long been fans of iA Writer, the app that lets users compose documents without cluttering the screen with annoying distractions. Kirk McElhearn called the Mac version of the program a “solid no-distraction writing tool.” Lex Friedman praised the iPad version as a “great tool in the writer’s arsenal.” The only Apple device left to conquer, then, is obviously the iPhone—and that’s what developer Information Architects did this week, updating its $1 iOS offering to a universal app that’s optimized for both phone and tablet. Like its predecessor, the app includes a “focus mode” that blurs out all but the few words of text you’re working on, allowing for maximum concentration. Dropbox and iCloud compatibility allow you to sync documents across devices, and AirPrint lets you make a hard copy directly from your iOS device. MotionX Sleep: We’ll be honest: The iPhone is a device that usually keeps us from sleeping—if we’re not getting late-night phone calls, we’re using it to check mail and Twitter way past healthy hours. But MotionX Sleep, a $1 app from Fullpower Technologies, aims to reverse the trend: It uses the motion sensors in your phone to track your sleep, and offers week-long and month-long analytics to help you determine if you’re reaching your sleep goals. It also works as an iOS-pedometer of sorts, tracking your movements throughout the day to determine your activity levels, and sounding a “Get Active” alert if it determines you’ve been sitting still too long. It is literally the Chris Trager of iPhone apps. WallitApp: Here’s a free offering that combines the proximity-driven social networking of the Color app with a splash of augmented reality: Wallit offers users the ability to leave messages on virtual walls at major landmarks in certain cities that can only been seen by other nearby iPhone owners using the app. (This video offers a guide to Wallit’s use.) The company suggests the app can be used for everything from a surprise marriage proposal to trash talking with other fans at a big sporting event. So it turns out that the iPhone can put one more notch in its belt: It has made graffiti legal!